Marie Jo Bennett, our sweet Mother, entered her heavenly home on Monday, April 8, 2019 at the age of 98 years, 2 months and 3 days. Marie’s life will be honored at graveside services at 11:00 am., Thursday, April 11, 2019, at Mount Hope Cemetery in Anson with Rev. Joe Walton and nephew Rev. Jim Alling officiating. Arrangements are under the direction of Kinney-Underwood Funeral Home in Stamford. Marie Jo Elliott was born on February 5, 1921, in DeLeon, Texas, the daughter of the late Joseph and Zeta (Green) Elliott. Marie’s family moved to Stamford at the age of 4 years and she attended Stamford schools and was a 1940 Stamford High School graduate. On December 20, 1945, Marie married Homer Bennett in Stamford, Texas and to this union were born a son, Blaine and a daughter, JoAnn. Homer preceded Marie in death on July 6, 1983. Marie enjoyed her occupation of being a dedicated homemaker to her family and had many hobbies including playing cards, bird watching and gardening. She was a longtime member of both the Pierian Club of Stamford and the Stamford Garden Club. Marie was always eager to share her talent of gardening and flower arranging by mentoring the other members of the Stamford Garden Club. You could always rely on Marie to be present and doing her part to make the annual local flower show a success. 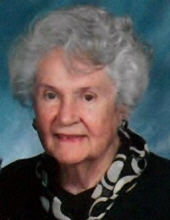 Marie was a member of First Baptist Church in Stamford for 60 years. Marie was preceded in death by her parents; her husband; a brother, CC (Buck) Elliott and his wife Doris Elliott. Family left to cherish this precious lady are her son and daughter in law, Blaine and Paula Bennett of Stamford; her daughter, JoAnn Calk of Haskell and grandson, Joel Calk of Abilene; and nieces and nephews. If desired, the family suggests memorial contributions made in Marie’s memory to the West Texas Rehabilitation Center, 4601 Hartford Street, Abilene, Texas 79605. To send flowers or a remembrance gift to the family of Marie Jo Bennett, please visit our Tribute Store. "Email Address" would like to share the life celebration of Marie Jo Bennett. Click on the "link" to go to share a favorite memory or leave a condolence message for the family.